Havells 6 L PEARL-WHITE Storage water heaters is a very comfortable and essential appliance to have in winter. It comes with Vitreous Enamel Coated Tank with single Weld Line Design & Made of Ultra thick super cold rolled steel plates. This Water heaters is Incoloy 800 glass coated Heating element offers superior heating performance resistance to both oxidation & carbonization at high temp. setting. Also resists erosion against most. It also comes with various features Energy Saving High Density PUF Insulations and 5 Star Rating as per BEE Standard. 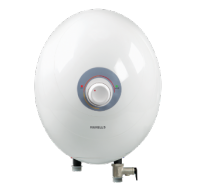 To Recieve updates and possible rewards for Havells Opal 6L Pearl White please sign in. To Recieve updates and possible rewards for Geyser/Water Heater please sign in.